Fox Soccer Match Pass is an online streaming service in the U.S. that allows fans to watch football games live and on-demand. 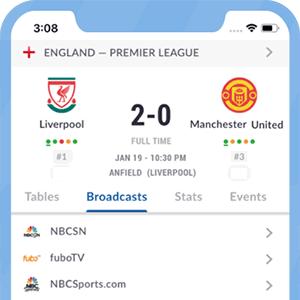 Fox Soccer Match Pass is available for Android, Kindle Fire, Android TV, iOS, Apple TV, Amazon Fire TV, Roku and Windows users. Fox Soccer Match Pass streams football games for some of the top competitions in Europe, games from South American tournaments such as the Copa Libertadores, matches from local leagues in America and in Europe, while also offering in-detail coverage of all the games played by the USMNT and USWNT. Fox Soccer Match Pass is only available in the U.S.. Users have to pay a variable subscription fee, since the platform frequently offers discounts to attract more users. Fox Soccer Match Pass also offers a seven-day trial period free of charge. All games streamed by Fox Soccer Match Pass can be watched both live and on-demand. *Got itLive Soccer TV does not provide FOX Soccer Match Pass live streaming. The information provided on this page is simply FOX Soccer Match Pass soccer TV schedule.